Today I am sharing a holiday card featuring this year's Christmas collections from Pion Design, "Christmas Wishes" and "Long Ago in Bethlehem". I just adore this image of Santa with his reindeer, so festive and fun! 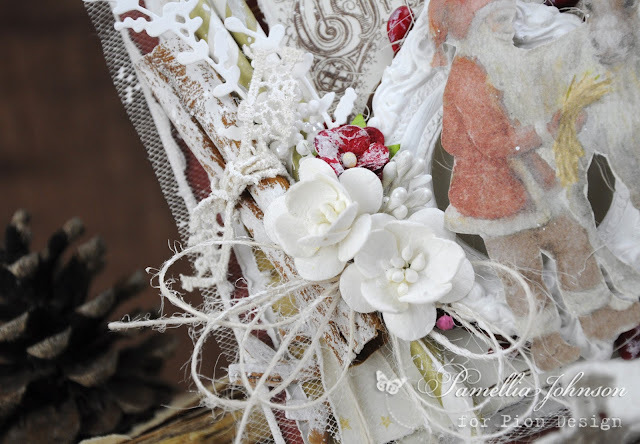 The flowers are from Wild Orchid Crafts, the mistletoe sprig is from W Plus 9. The cinnamon stick is real and I just brushed on a little white paint, sure makes the whole card smells Christmassy!!! I have tucked in a couple of bark snowflakes in the corners. I have a horrible habit of taking things out of the original package and now I can't figure out where to buy them. They're about 5cm wide. Does anyone know where I could purchase some more of these??? The leaves have pretty much all fallen off now and the world is turning grey. Thank goodness I still have some colourful autumn shots to share. This landscape was an early morning shot, the orange in the background is the sun reflecting off the lake. And so begins the season of puffed up birds! 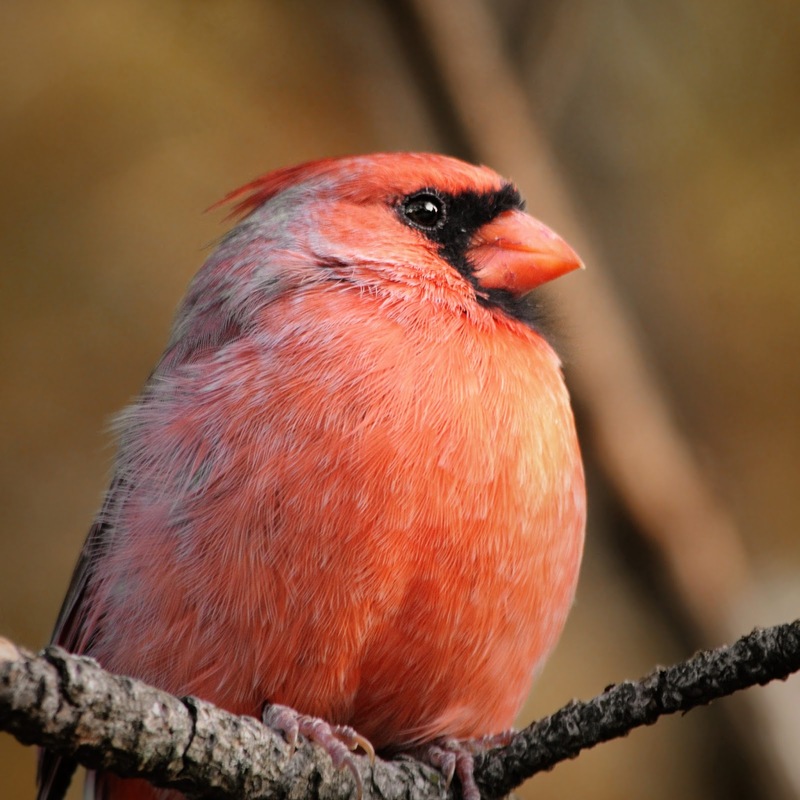 What's not to love about a pom pom shaped Cardinal! I was so excited to see this beautiful girl outside the other day! I decided to hang the suet feeder back up this week, and presto, within 12 hours this gorgeous Woodpecker shows up! To hell with the neighbours, the feeder stays! "Hmmm, it smells fine. So if there's nothing wrong with it, why would that human just give it to me?" 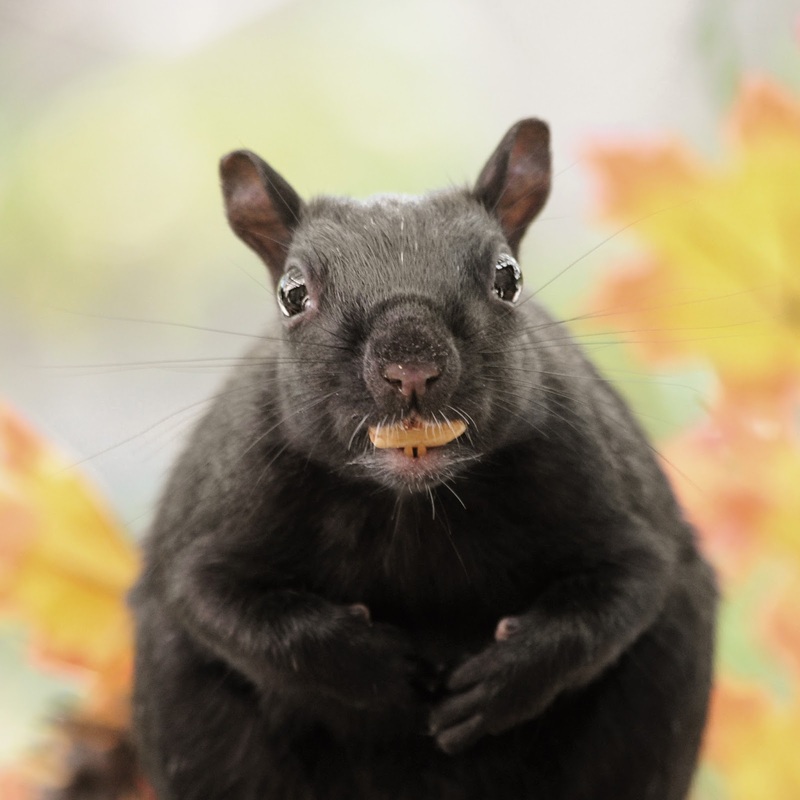 "Wow, I really need to get a human to squirrel translator, because this woman never stops talking and I have no freaking idea what she's saying!" "Omg Omg Omg! So I was walking along and I found a peanut just sitting there! I'm the Queen of the world!" "Oh boy oh boy oh boy! 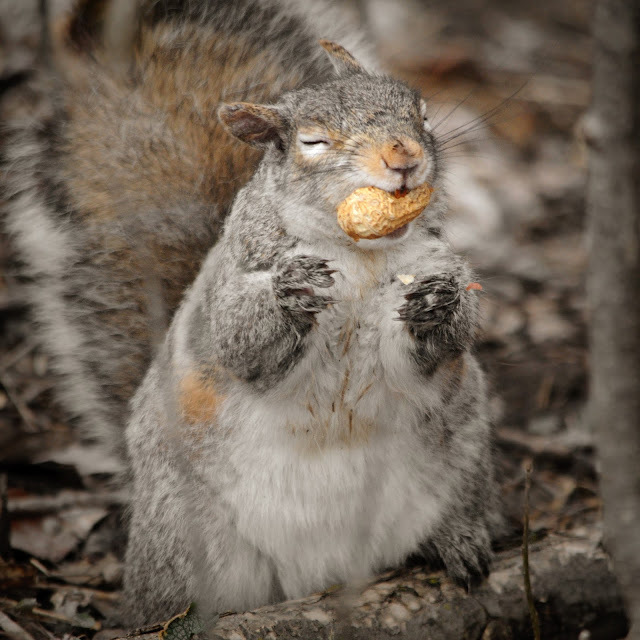 I got me a peanut, I did I did I did! For my macro today, these teeny weeny mushrooms. They were so small, the bigger ones were about the size of a single pea!! I have no idea how I even managed to spot them! That's it for today. Thank you for stopping in and for all the amazing comments. If anyone has a source for those bark snowflakes, please let me know in the comments. Oh my gosh, look at all those layers! Beautiful card, once again, Pamellia. Sweet photos, too. I see on your sidebar you have an etsy shop; however, when I try to click on it, nothing happens. 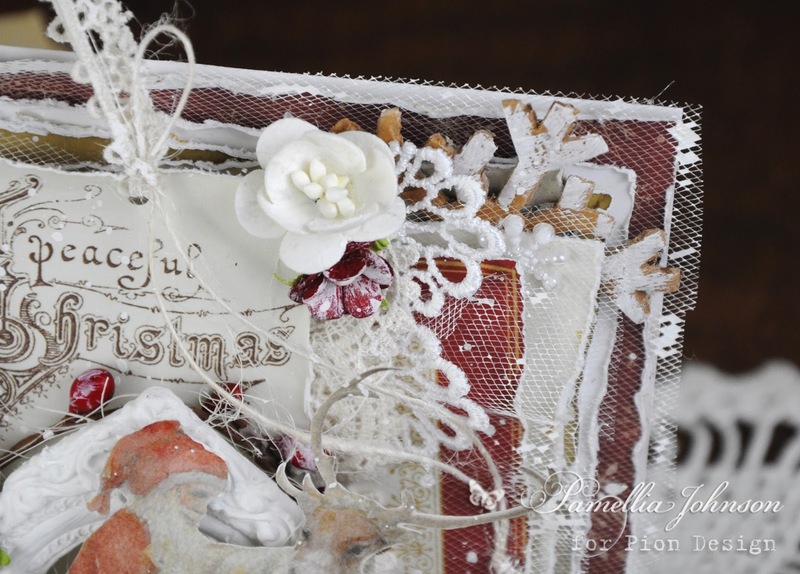 Gorgeous rustic Christmas card Pamellia! Love the tulle and all the pretty layers of embellishments. Oh wow, this is absolutely stunning, Pamellia!! I love how you've showcased Santa and his reindeer!! The layers are spectacular!! The bits of lace and ribbon you tuck in are just perfect!! This is amazing!! I love, love it!! Fabulous and festive! This is gorgeous Pamellia, beautifully designed as always and how lovely to include the cinnamon stick for a wonderful Christmassy fragrance! 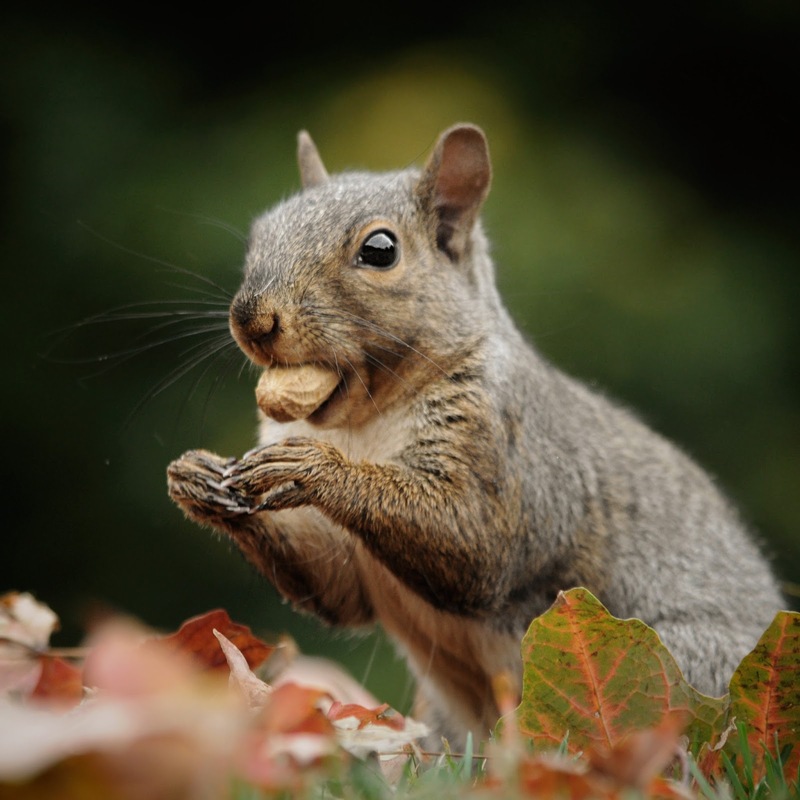 Lisa is right, the squirrels do look as if they're posing! wow..stunning Pamelia..all those wonderful layers and love the perfectly placed straws..and then we have those cute little Squirrels with their peanuts..so funny and so cute..cannot help with bark snowflakes..but if you google and give enough words in the description they will probably find them for you...good luck. Absolutely gorgeous Christmas card all those incredible textured layers and fabulous embellishments -I am with you RE the feeder and neighbours amy sentiment exactly!!! Stunning laered card with those beautiful Pion papers and your photos, - what can I say, the expressions of those squirrels are just priceless! And the birdfeeder, what could your neighbours possibly have agaist that?? Its a gorgeous card and as always your layers look amazing. The photos are fantastic and you always seem to add the right word captions to bring a smile to my face as I read them. Beautiful card Pamellia, I love the vintage vibe you capture so perfectly. I really think you should be winning awards for your photography as it so amazing! Such glorious layering, very Christmassy and full of lovely details!! The snowflakes are fabulous, as well the Santa's image and -wow- a real cinnamon stick!! You have had a clever idea! Surely it smells all over! :) Love the laces and all the embellishments! Princess Tabitha's photo is just a delight!!! Her satisfied face is a gift for you! :D Love seeing her cuteness! Amazing also all the squirrels and birds! 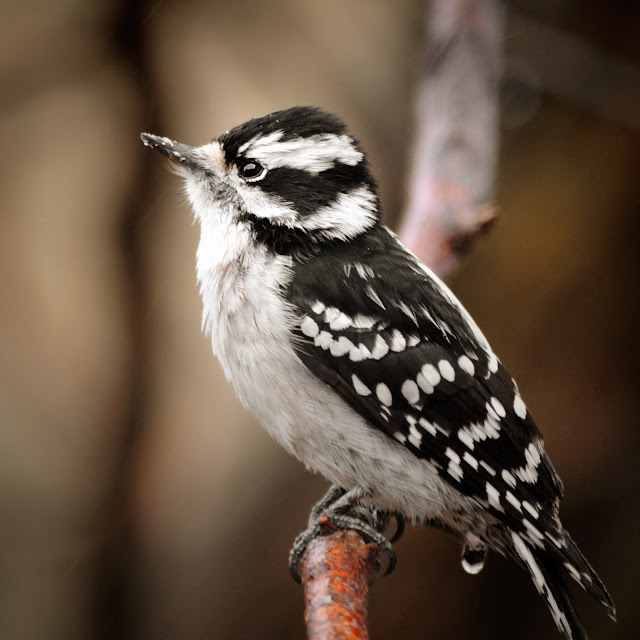 LOVE Sweet Cheeks and Mistro and such adorable Woodpecker !! 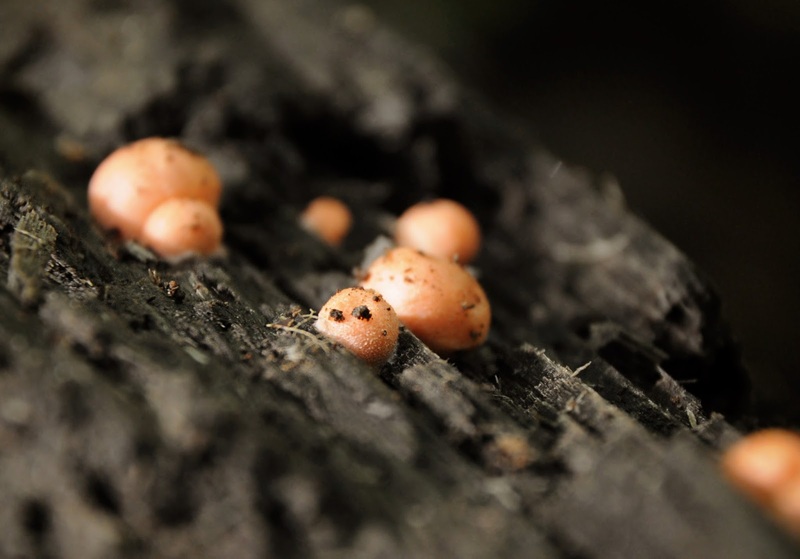 Great macro shoot of the tiny mushroom, too! What a wonderful card Pamellia, so many gorgeous layers to it. 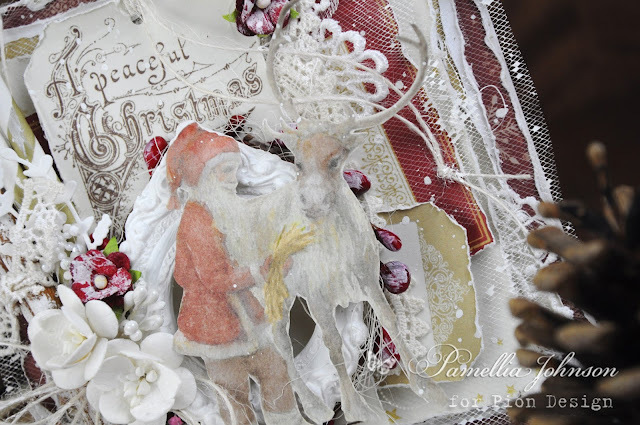 I love the embellishments and that marvellous Santa image. The Cardinal bird is amazing, what a wonderful colour he is, the woodpecker too is fabulous. hahaaaahaaa Your photo and the quotes are hysterical!!! You make me laugh so much! I wish my photos would come out as well! I will send you an email soon-letting you know who it out there eating! I love your card Pamellia, but must admit, the graphic is hard to see- is it light or is the lighting bright? I love my visits here- you always make me smile! 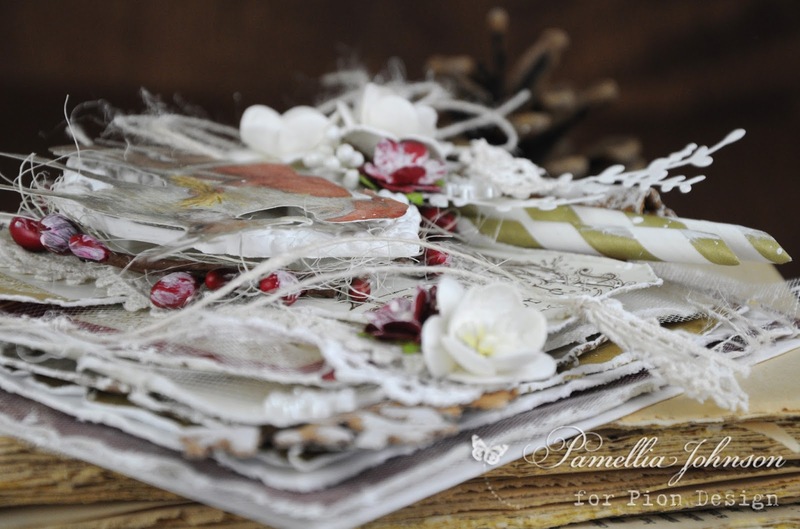 A beautiful card Pamellia, so many gorgeous layers and I bet it smells nice too. 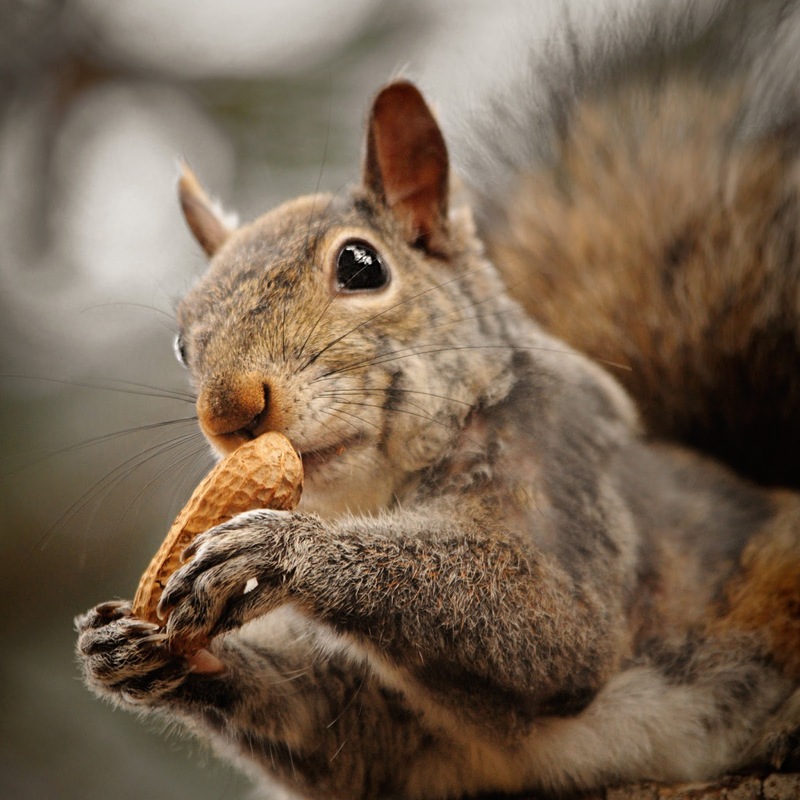 Fabulous photos that bring a smile, you really capture the squirrels expressions so well. Sorry, I can't help you with the snowflakes but they are lovely! 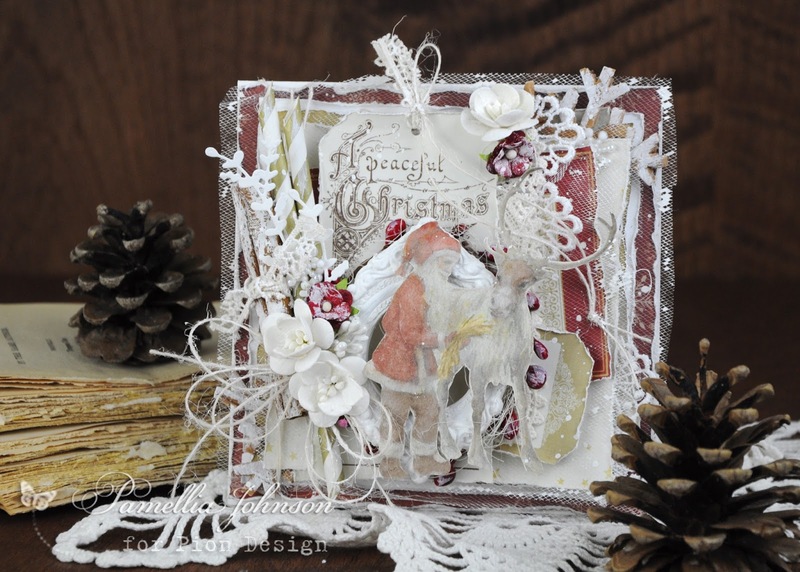 Those papers are gorgeous, your layering up is always superb and I love the gorgeous image of Father Christmas - this is one of those cards that I want to reach out and touch, it looks so tactile! Ooooh!!!! I bet this card smells delightful!! I love that you used a real cinnamon stick .. something I have wanted to do but can never find one small enough around .. the ones I have found are all really huge!! Wow! Wow! Wow! Another spectacular card Pamellia!! I love all the layers .. the gorgeous papers and lace and tags and fibres and snowflakes (sorry, I can't help with those either) everything just fits together so beautifully and the image of Santa and his reindeer is the perfect finish!! Love, love, love .. I have another fave!! Your photos and matching comments just crack me up!! I love them so much!! 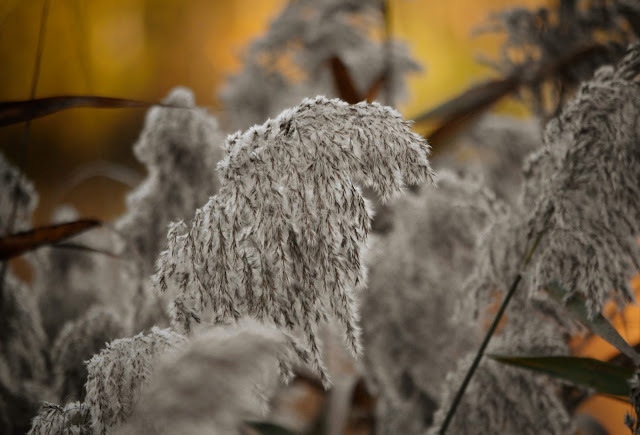 Lovely Pamellia filled with the fragrance of cinnamon on that snowy iced texture. I love to be drinking my mulled wine from one of those straws this Christmas. I love all the yummy layers on your card today. It's genius the way you can read animals minds. Are you sure you're not Snow White? 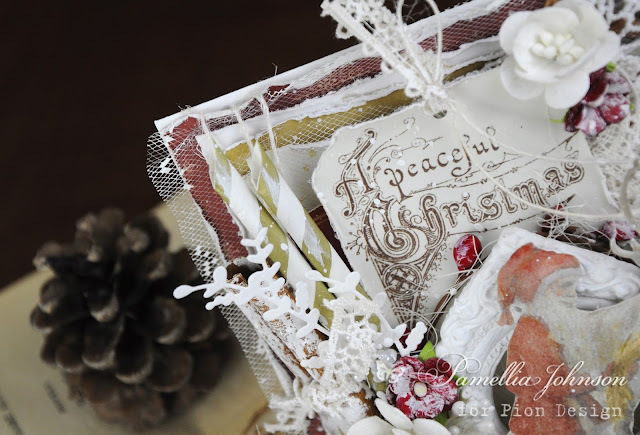 A beautiful card so filled with yummy layers and so many wonderful textures to touch! I love the laces, the flowers, the cinnamon stick (Oh, I bet this smells wonderful, but oh so expensive to purchase!) straws and that amazing Santa image! Your photos are fabulous, and I love the captions! This is somehting Ireally look forward to on your blog! I'm soooo far behind at visits, but the good news is I have so much to look forward to! Please pardon my absence. Life is getting in the way of my regular visits. Love seeing your have a craft market on Etsy! I bet you are going to sell out fast! Sending big hugs your way! Ow, in case I forget. I love those tiny mushrooms, wow or what! What a fabulous card, I love all of those layers, I could not count them all but they look totally fabulous. As always, wonderful embellishments and I love the netting, I think I need some of that in my collection.